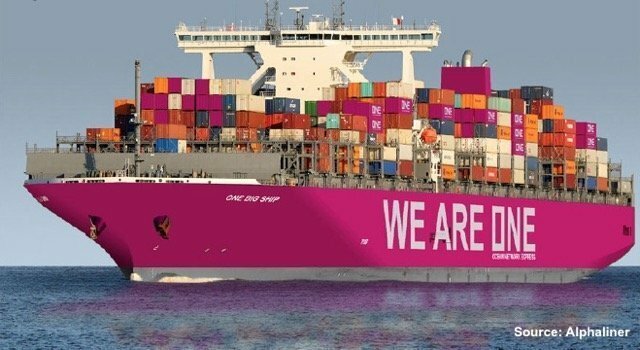 The Japanese can crack open the magenta paint today as the final regulatory approval was crossed in the creation of the dark pink branded Ocean Network Express (ONE). South African competition watchdogs had held up the process for around six months but finally have given their blessing to the tie up of the liner divisions of Kawasaki Kisen Kaisha (K Line), Nippon Yusen Kaisha (NYK) and Mitsui OSK Lines (MOL), paving the way for the 1.44m teu giant to start operating as planned on April 1 this year. A previous car carrier cartel investigation in South Africa involving all three Japanese companies had put local watchdogs on alert when it came to approving ONE. To be run out of Singapore with NYK’s Jeremy Nixon at the helm, ONE, which will feature magenta coloured vessels, will be the sixth largest containerline in the world, its creation coming about as a result of the dramatic consolidation seen within the sector in other parts of the world over the past three years.